For many families in Italy, Christmas Eve, La Vigilia di Natale, is when the Christmas festivities take place. Families get together, share a meatless meal (some require a specific number of fish dishes), open gifts, and attend midnight mass. After the mass, meat dishes can be served. Sweets and alcohol generally accompany the whole thing, along with laughter, tantrums, cooking, cleaning up, TV and DVD movies and music. It's a pretty common Italian tradition that the older children spend Christmas Eve with their families, and New Year's Eve with their friends. So everyone is together for Christmas Eve. There are family traditions, town traditions, regional traditions and some traditions that could be called 'Italian', such as watching the Pope conduct Christmas service (at midnight or the next day), or watching the specials televised by the major TV channels. Many hyphenated Italians, living in far off countries, follow the traditions carried over by their ancestors who emigrated from Italy decades earlier. Some hyphenated Italians are rediscovering Italian Christmas traditions such as the presepio and a Fish Feast. 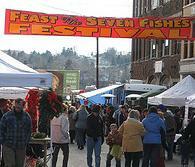 And some non-Italians are adopting the Fish Feast for health and taste reasons, sometimes moving it to Christmas Day. 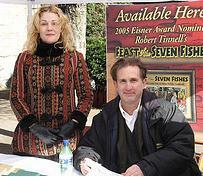 Writer, film-maker, Robert Tinnell, grew up in the small town of Rivesville, West Virginia, in an extended, Italian-American family. His comic strip/graphic novel and possible film (see below) are based on his experiences. Here are some excerpts from his book (with some paraphrasing). "The story of the fictional Oliverios, for all its ethnic flavor, is an American story. I really want to explore how it is we became so assimilated. 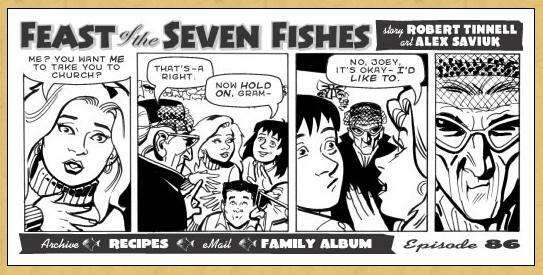 It's fascinating that while many of us in the family aren't even Catholic, don't even have Italian last names, we still carry on this [the Fish Feast on Christmas Eve] and other traditions that have been practiced by our family for centuries. We do it for the fun and the fact it makes us feel closer to loved ones both living and dead." "Greentown was so-named because the coal company got a deal on green paint and painted all the company houses green. 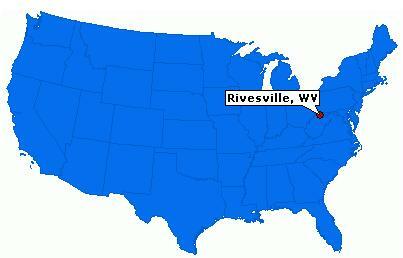 It is actually a neighborhood in the small town of Rivesville, West Virginia. 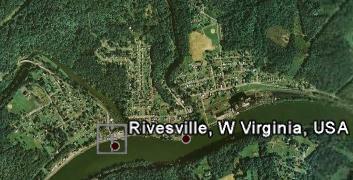 Rivesville sits along the banks of the Monongahela River. 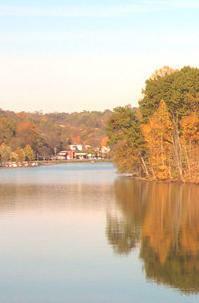 Like many of its neighbors, the town spent its first 100 years or so as a quiet farming town. Then the coal boom hit. Soon after, the immigrants came. The town was transformed. 'Even when I was a kid people still yelled at their grandchildren in foreign languages. The old folks' yards were jammed with gardens. My great-grandmother's yard was famous in town for her well-manicured, productive vegetable plot. She grew an amazing quantity of produce on that small lot. A few years ago, traveling in the south of France and northern Italy we felt like we were coming home; I saw her sense of economy and industriousness in hundreds of similar gardens. Not a square foot goes to waste when it can be used for growing something." "A great percentage of the Italians in the Rivesville area are Calabrese -- meaning from the southern Italian province of Calabria. More specifically, many of the immigrants came from a town called San Giovanni en Fiore. 'So the connections between families can go way, way back. That, and the shared traditions, creates a bond. When the first immigrants arrived, they were worked hard in the mines and the mills under terrible conditions, for worse pay. But they were an industrious people. They prospered. And they brought a vibrant element into their communities. 'They loved America and pushed their children to speak only English (my grandfather refused to teach me Italian -- other than several swear words I still use with alarming frequency). 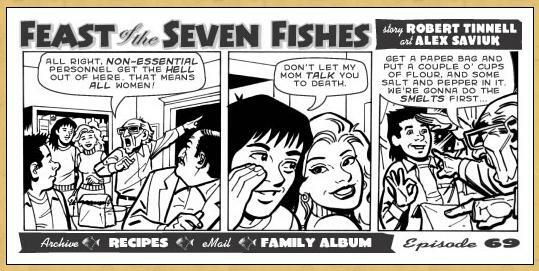 I didn't even know our dinner was called the Feast of the Seven Fishes until I was nearly thirty, or that its Italian name was La Vigilia, until I was older than that." "My great-grandmother served the Feast in the basement of her tiny house. I cannot believe how many people she managed to squeeze into that small cinder block room; my grandparents, parents, aunts and uncles, great-aunts, assorted neighbors, fraternity brothers, girlfriends. 'She would cook the meal over a woodstove. Working alone, or perhaps with one of my great-aunts, she would produce mounds of whiting, smelt and calamari. There were always oysters. And she made a soup -- a broth really -- composed of all the different seafood. I called it "bread soup" as a kid because we always threw hard bread in it when we ate it." "In a side room sat two oak casks that contained the Chianti she made. It may be considered gauche to serve anything other than white wine with fish, but in that house it was Chianti. Very dry, cut-your-tongue-like-a-knife Chianti. Delicious. I remember as a little kid being bummed out because she would only let you have Chianti with her pasta, which was always very arribiata -- spicy! It didn't do much to quench your thirst." Shannon Tinnell wrote the recipe portion of the book, providing 15 recipes, not all fish recipes (see below). Here are some of her comments about the traditional Feast. "My family came from Abruzzi, and their traditions were somewhat different [than Robert's family traditions]. Sooner or later we come to a compromise [on the Feast menu]. The traditional menu that my husband grew up with includes pan-fried smelt, stuffed squid, baccala, whiting, fish soup, oysters and sometimes shrimp or eel, or even octopus. I try to include new dishes, as well as more recent additions like my linguine with clam sauce. 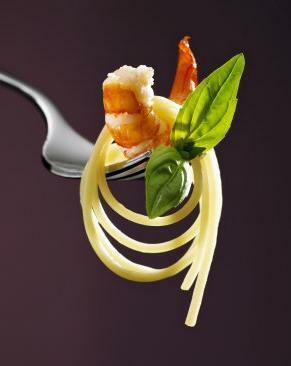 'Being a meal composed primarily of seafood, it's essential that everything be prepared with the freshest ingredients. 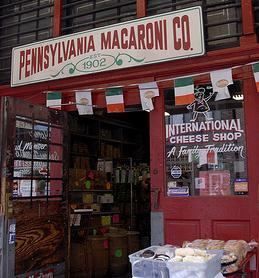 So each year we pack the family up and make our pilgrimage to the Strip District in Pittsburgh, Pennsylvania (a stone's throw from Bloomfield -- ground zero for my Colaianni ancestors when they hit America). 'It's a mad race to get dinner off by 6:30 or 7 p.m. -- set to the sounds of Dean Martin and Louis Armstrong, and the ubiquitous polka (don't ask -- I haven't figured it out either). Things really heat up about an hour before serving. All the various fried foods are being prepared simultaneously, and the baked dishes go into the oven. 'Once the meal is on the table, dinner runs on for hours. Family and friends come and go, and the laughter and joy prove contagious. "[The Feast] allows us to connect in some small way with our Italian heritage. 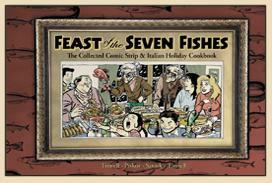 My great-great-grandparents celebrated the Feast of the Seven Fishes. I hope my great-great-grandchildren will as well." 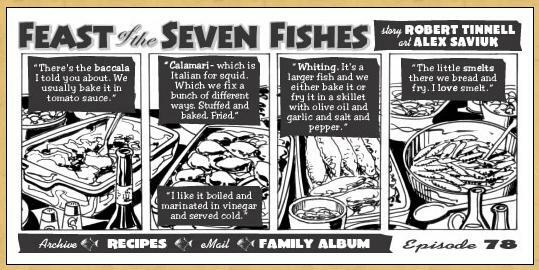 Robert Tinnell's Feast of the Seven Fishes has taken on a life of its own. It began as his family's story of Christmas Eve, preparing seven fish dishes. It became a 'graphic novel', or strip, telling such an engaging story, appreciated by so many, that it may become a film. 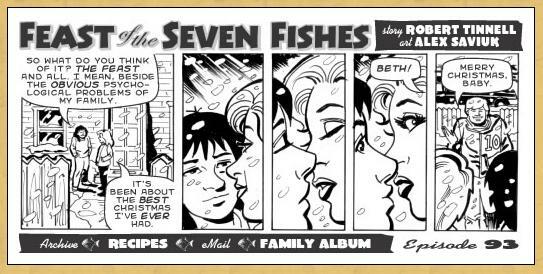 You can purchase the complete comic strip, together with the fish recipes, courtesy of Robert's wife, Shannon (15 recipes, not all fish recipes), a Foreword by Steve Geppi, and a section by Robert Tinnell discussing his inspirations, 92 pages in all. Besides getting recipes for your own Italian Christmas Eve, you have a fun book for the family to read while digesting, but be aware there is some suggestive language, so not for small children. The author has a strong presence on YouTube.com, so be sure to search for him there, to see his real family members cooking fish, with some salty language. And he hosts a blog celebrating things Italian, especially Italian cooking (not just fish). Here are excerpts from the book. The story features a Christmas Eve, mixed-background romance that might not take.